Este documento, gratuito, apresenta a compilação dos artigos publicados durante a Conferência Portuguesa de Reconhecimento de Padrões, na Universidade de Coimbra, 26 de Outubro de 2018. 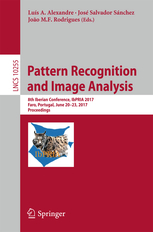 This book constitutes the proceedings of the 8th Iberian Conference on Pattern Recognition and Image Analysis, IbPRIA 2017, held in Faro, Algarve, Portugal, in June 2017. This book constitutes the refereed proceedings of the 8th Iberian Conference on Pattern Recognition and Image Analysis, IbPRIA 2017, held in Faro, Portugal, in June 2017. The 60 regular papers presented in this volume were carefully reviewed and selected from 86 submissions. They are organized in topical sections named: Pattern Recognition and Machine Learning; Computer Vision; Image and Signal Processing; Medical Image; and Applications. 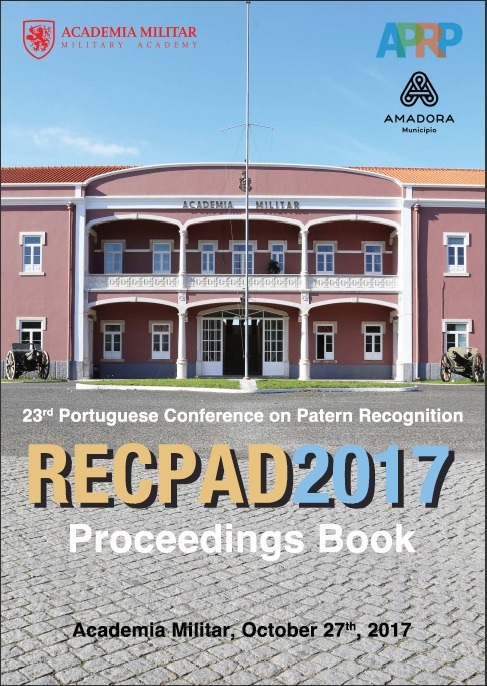 Este documento, gratuito, apresenta a compilação dos artigos publicados durante a Conferência Portuguesa de Reconhecimento de Padrões, na Academia Militar, 27 de Outubro de 2017. 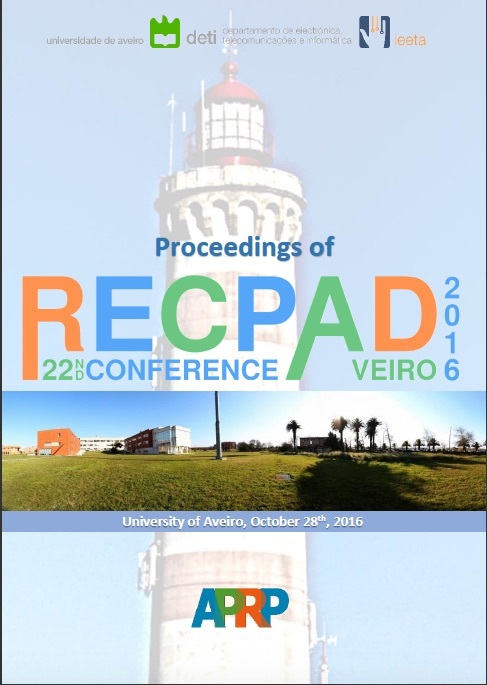 Este documento, gratuito, apresenta a compilação dos artigos publicados durante a Conferência Portuguesa de Reconhecimento de Padrões, na Universidade do Aveiro, 28 de Outubro de 2016. Este documento, gratuito, apresenta a compilação dos artigos publicados durante a Conferência Portuguesa de Reconhecimento de Padrões, na Universidade do Algarve, 30 de Outubro de 2015. Conferência Portuguesa, na Universidade da Beira Interior, Covilhã, Portugal, 31 de Outubro de 2014. Este documento, gratuito, apresenta a compilação dos artigos publicados durante a Conferência Portuguesa de Reconhecimento de Padrões, na Universidade da Beira Interior, 31 de Outubro de 2014. 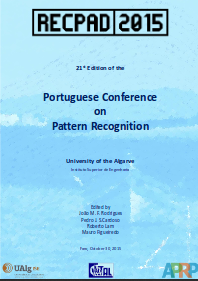 This book constitutes the refereed proceedings of the 6th Iberian Conference on Pattern Recognition and Image Analysis, IbPRIA 2013, held in Funchal, Madeira, Portugal, in June 2013. The 105 papers (37 oral and 68 poster ones) presented were carefully reviewed and selected from 181 submissions. 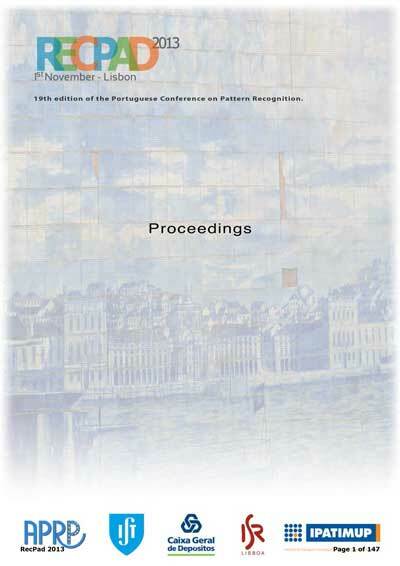 The papers are organized in topical sections on computer vision, pattern recognition, image and signal, applications. Conferência Portuguesa, no Instituto Superior Técnico, 1 de Novembro de 2013. 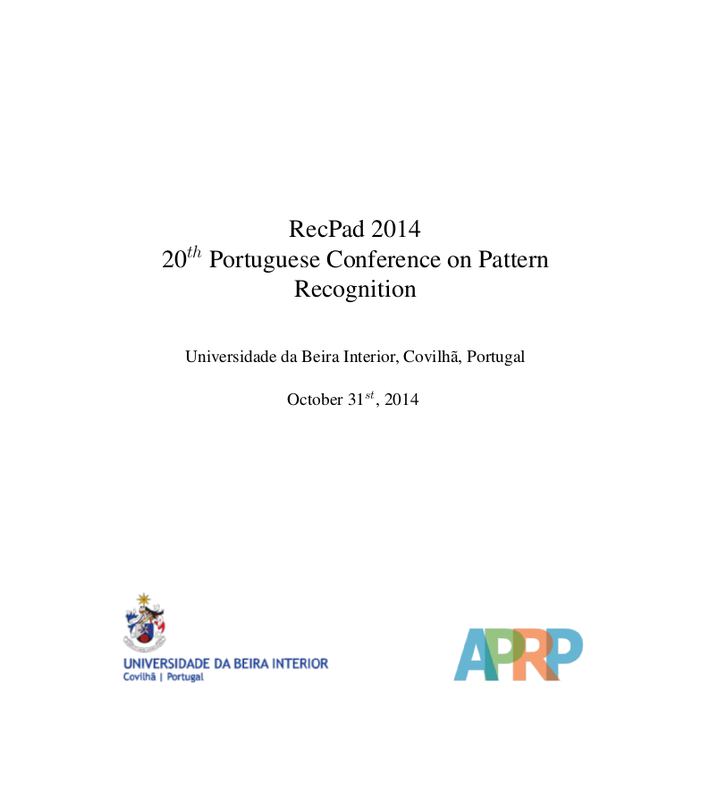 Este documento, gratuito, apresenta a compilação dos artigos publicados durante a Conferência Portuguesa de Reconhecimento de Padrões, no Instituto Superior Técnico, 1 de Novembro de 2013. Este documento, gratuito, apresenta a compilação dos artigos publicados durante a Conferência Portuguesa de Reconhecimento de Padrões, no Instituto de Engenharia do Politécnico de Coimbra, 26 de Outubro de 2012. 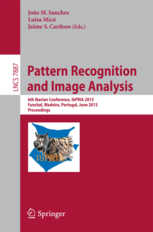 This volume constitutes the refereed proceedings of the 5th Iberian Conference on Pattern Recognition and Image Analysis, IbPRIA 2011, held in Las Palmas de Gran Canaria, Spain, in June 2011. The 34 revised full papers and 58 revised poster papers presented were carefully reviewed and selected from 158 submissions. The papers are organized in topical sections on computer vision; image processing and analysis; medical applications; and pattern recognition. De: Araújo, H.J. ; Mendonça, A.M.; Pinho, A.J. ; Torres Barañano, M.I. 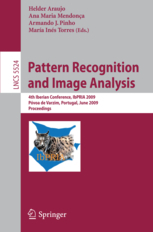 This volume constitutes the refereed proceedings of the 4th Iberian Conference on Pattern Recognition and Image Analysis, IbPRIA 2009, held in Póvoa de Varzim, Portugal in June 2009. The 33 revised full papers and 29 revised poster papers presented together with 3 invited talks were carefully reviewed and selected from 106 submissions. 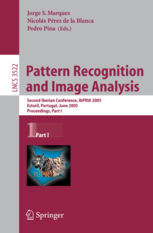 The papers are organized in topical sections on computer vision, image analysis and processing, as well as pattern recognition. 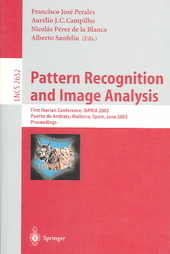 The two-volume set LNCS 4477 and 4478 constitutes the refereed proceedings of the Third Iberian Conference on Pattern Recognition and Image Analysis, IbPRIA 2007, held in Girona, Spain in June 2007. The 48 revised full papers and 108 revised poster papers presented together with 3 invited talks were carefully reviewed and selected from 328 submissions. 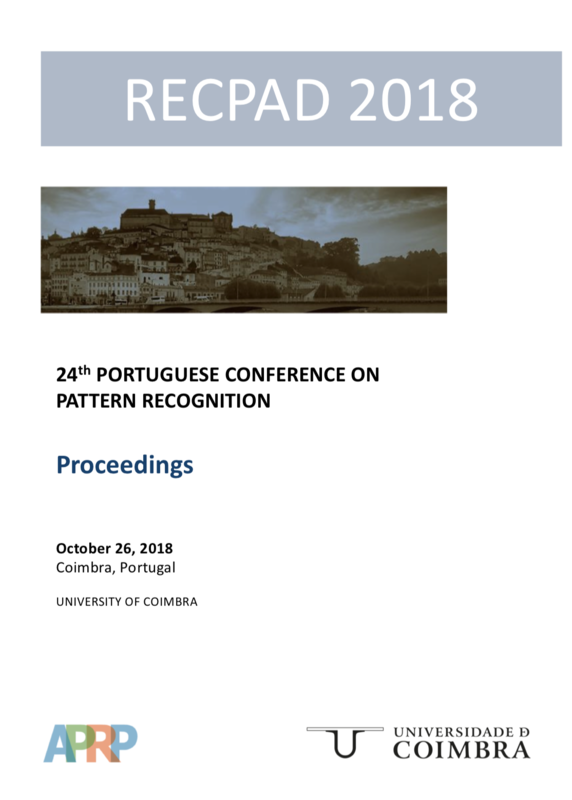 The papers are organized in topical sections on pattern recognition, human language technology, special architectures and industrial applications, motion analysis, image analysis, biomedical applications, shape and texture analysis, 3D, as well as image coding and processing. 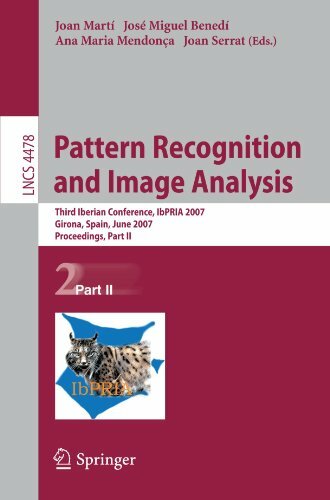 This book constitutes the refereed proceedings of the First Iberial Conference on Pattern Recognition and Image Analysis, IbPria 2003, held in Puerto de Andratx, Mallorca, Spain in June 2003. The 130 revised papers presented were carefully reviewed and selected from 185 full papers submitted. All current aspects of ongoing research in computer vision, image processing, pattern recognition, and speech recognition are addressed.